To use this you just unplug the 8 pin plug in your jukebox and plug the above between the existing cable and socket. 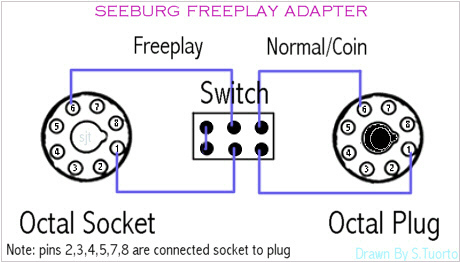 Flip the switch one way and it's freeplay the other and it's normal operation. It can be built like this or put into a box. This adapter circuit should work for all M100A, M100B, M100BL, M100C, HF100G, HF100W, HF100R, HF100J, and HF100JL. 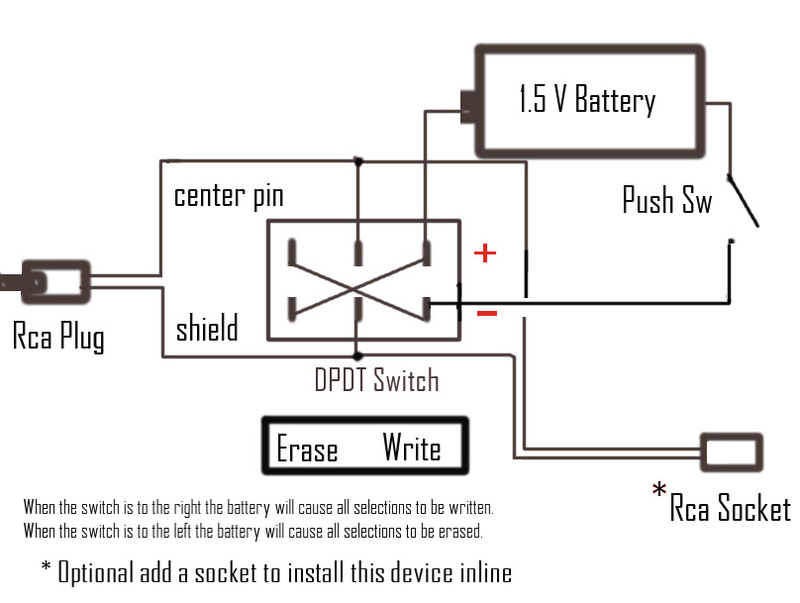 Unlike a version that is being sold on ebay this circuit will not release a single button press. In other works if one key (letter or number) is pressed and a second is not the latch solenoid will remain on and not release. It works by supplying a ground to the selector leaf switches which latches the selector solenoid. As long as the letter / number combo is completed the buttons will release and credit light will go off. When time permits I will enhance this by adding a time out ct to disable the above if selection is not completed in a set time. If anyone has the time and adds the time-out feature let me know, I'll include it here. BTW a lot has been made about a 1 key press not releasing and damaging the solenoid or worse. This should never really be an issue in your home. The same thing could happen on coin operation, and Seeburg designed it so it could be left on for a while without damage. I keep an eye on my machines, maybe more so when their are guests or children present. So leaving a solenoid engaged for days....would NEVER happen, hence I think it to be a non issue. Assault Stereo Speaker Upgrade - Add stereo sound! 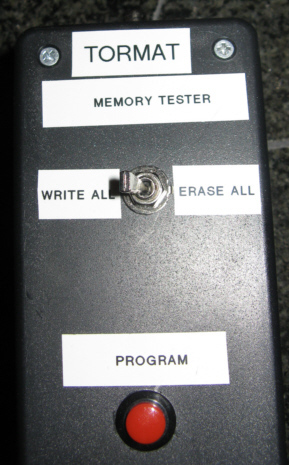 HARDMVS - restoring a NEO cabinet look here. Mercury Amusement Co. - "Pinball information for collectors and homeowners"
Switch Settings Archive - As the name suggests. Turaco - Edit game character sets. www.hardmvs.com - Every one who is restoring a NEO cabinet should know this website. www.southtown-homebrew.com - Good place to get shockboxes, inserts, and NEO parts and games. www.lizardlick.com - Very well know arcade company. This is where most of the street fighter and fighting game people get most of there Sanwa and semitsu joysticks and buttons. Customer service is excellent. This is the only place other then Happ where I order my joysticks and buttons from. www.happcontrols. - Very well known arcade and redemption parts distributor. Majority of all the US made cabinets use Happ parts. www.jammaboards.com - Well know website to order jamma harnesses, boards, adpaters, etc. 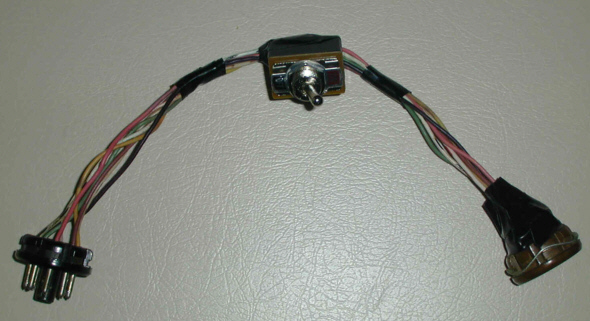 They also make prewired MVS harnesses to replace your old one in your cabinet if its faulty. www.arcadeshop.com - Good place for your control panel overlays and graphics. www.eplastics.com - Good place to get custom or pre-cut plexiglass for your marquee or control panel. 50th State Coin-Op - "...distributor of coin-operated equipment. We sell/service video games/boards, pinballs, redemption equipment, etc.". ACME Amusement - "For the past 13 years we have been providing unique and exciting games along with superior service...". Betson Imperial Export Corp - "Servicingthe world's coin-op & billiards needs for over 60 years". Birmingham Vending Company - "your complete source for Amusement and Vending equipment". Dynamo, Ltd. - "Manufacturer of coin operated amusement games with international distribution". Eldorado Games -"Board exhange and sale"
Great Games Plus Inc. - Arcade merchandise. Happ Controls, Inc. - "A leading manufacturer and distributor of components used within the industry". Home Gameroom Goodies - "You can find bits and pieces of nostalgia, memorabilia, Americana and 'what-have-you'...". J E Sheeran Amusement Arcades Ltd. - "Gaming equipment, amusement games and arcades, Scotland". John's Jukes Ltd. - "Pinball, video and jukebox corner". Merit Industries, Inc - "Manufacturer of coin operated games oriented for the tavern market". Mondial International Corporation - "The world's foremost distributor of coin-operated equipment". Mr. Pinball - "Mr. Pinball restores, buys, sells, trades and repairs pinball machines". Namco - Home of Namco. Pinball Palace - "We always have a sale at Pinball Palace". Real Bob Roberts - "Parts supplier"
Sega GameWorks - "EVERYTHING YOU WANTED TO KNOW ABOUT ADRENALINE PUMPING ARCADE ACTION"
Subsino Corp Ltd. - "Producer and manufacturer of many arcade games for 13 years". Two Bit Score Amusements - "...those of you who own or repair coin-operated pinball machines and video games"
Video Connection - Sale of video games/boards/etc. GOOD. Videotopia - "...offers a taste of the experience of visiting VIDEOTOPIA, the sweeping journey thru the evolution of gaming technology".